Labour Minister Mervyn Silva has given an undertaking to the Supreme Court that he will refrain from harassing or disrupting the duties of media personnel in the future. His promise came today (Dec. 17th) when the SC took up a fundamental rights petition filed by a camera journalist of MTV Channel (Pvt.) Ltd. The petitioner claimed the minister had prevented him from carrying out his duties at the opening of the Kelaniya flyover. The SC also ordered the minister to pay Rs. 750,000 as compensation for the damaged camera equipment of the media institution. Journalist Sivaram was murdered in April 2005 in Colombo. High Court Judge Ms Kumudhini Wickremasinghe said the trial would begin on June 1 and would continue till its completion, legal sources said. In an extraordinary outburst last week, Sri Lankan President Mahinda Rajapakse lashed out at the country’s Supreme Court, accusing it of undermining his powers, and issued a barely disguised threat that the judges could find themselves the target of violent thugs. While declaring that the government respected the court’s rulings, the president ominously reminded the judges of what had happened in the past. “Gentlemen of the judiciary might have forgotten about the time when the homes of the judicial officers were stoned and impeachment motions brought against three Supreme Court judges,” he said. Rajapakse’s reference was to the early 1980s when President J.R. Jayawardene sought to intimidate the Supreme Court after it ruled against police officers who had brutally attacked peaceful protesters opposed to his government. Thugs associated with Jayawardene’s United National Party (UNP) attacked the houses of the judges and an unsuccessful attempt was made to impeach them. Rajapakse’s comments are not an idle threat. His government has escalated the communal war begun by Jayawardene against the Liberation Tigers of Tamil Eelam (LTTE). 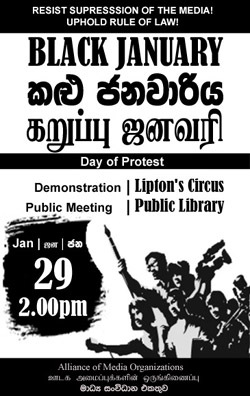 In the name of national security, Rajapakse has severely curtailed basic democratic rights, threatened the media and attempted to silence critics. Over the past two years, hundreds of people have “disappeared” or been murdered by death squads operating in collaboration with the security forces. Journalists have been threatened, detained, abducted or killed. Now Rajapakse is turning his sights on the judiciary. He is particularly antagonistic to a Supreme Court decision to order the government to establish the Constitutional Council in accordance with the 17th amendment to the constitution passed in 2001. Rajapakse has simply ignored the constitutional requirement for past three years, using the pretext that he had appointed a parliamentary commission to re-examine the 17th amendment and was awaiting its report. The Constitutional Commission, which is jointly appointed by the government and opposition, has powers to make appointments to other commissions established under the 17th amendment covering the police, electoral department, judiciary and other areas of public administration. While the amendment was meant to placate public anger over rampant corruption in the state apparatus, even these limited measures are intolerable to Rajapakse. As public hostility to the war and its impact of living standards has risen, Rajapakse has increasingly concentrated power in his own hands and those of his close associates—particularly his brothers. The president holds the posts of defence and finance. His older brother Chamal is minister for ports and aviation. Younger brother Gotabhaya holds the powerful position in the state bureaucracy of defence secretary and Basil was put in charge of the “liberated” east after the LTTE was driven out. Basil Rajapakse is also the president’s right hand man when it comes to keeping the government’s unwieldy parliamentary alliance in check. The ruling coalition is composed of disparate parties, all of which have received political payoffs in the form of ministerial posts and other perks. Sri Lanka currently has one of the largest ministries in the world, but the real decisions are made at the presidential secretariat rather than in cabinet. To maintain his precarious grip on power, Rajapakse has had to resort to personal appointments—on a scale that is unprecedented even by Sri Lankan standards—not only to secure allies but to install his loyalists into key posts to ensure his policies are implemented. The establishment of the Constitutional Council, in which the parliamentary opposition leader and opposition appointees sit, would cut across Rajapakse, which is why he has manoeuvred to block it. The Supreme Court ruled that the body had to be appointed by December 4, but the attorney-general pleaded for an extension on the basis that the president was out of the country on that date. Now the Supreme Court has ruled that the president has to install the Constitutional Council by January 15 and left Rajapakse with no legal escape route. It was at this point that he lashed out last week at the judges. The Supreme Court in Sri Lanka is no great defender of constitutional or democratic rights as an examination of its record would show. Its latest rulings, however, reflect growing fears in the country’s ruling elite that the Rajapakse government, as it prosecutes the war, is increasingly breaking with the norms of parliamentary democracy and assuming an autocratic form. The concern in these circles is not over the war, with which the entire establishment in Colombo agrees, personal corruption or the abuse of democratic rights. The real fear is that this brittle regime will break apart amid mounting popular opposition and threaten the stability of capitalist rule. The rulings over the Constitutional Council are only the latest in a series of cases brought by several non-government organisations, including the Centre for Policy Alternatives and Transparency International. In July, the Supreme Court removed the treasury secretary, P.B. Jayasundera from his post for his role in the privatisation of the state-owned Lanka Marine Services Limited, which the judges found was “irregular and designed to suit one party”. Determined to keep Jayasundera’s services, Rajapakse sent him as a special presidential envoy on a trade delegation to Iran, then appointed him as a special presidential advisor to finance. A Supreme Court instruction to the police Criminal Investigation Department (CID) and the Commission to Investigate Bribery and Corruption (CIBC) to investigate Jayasundera over criminal charges has been ignored. The judges issued an order to the police top brass, CID, CIBC and the attorney-general to appear in court to explain what action they have taken. Jayasundera had not even been questioned by police. When the case was taken up on September 29, Chief Justice Sarath N. Silva ruled that the CID director “should be removed from office for failing to perform his duties”. It was only when the judges ordered Jayasundera to appear in court on October 8 that he resigned his posts and gave a guarantee that he would never enter the public service in future. Another case related to a gazette notice published on August 11 vesting the president with the power to extend the service of any public officer beyond compulsory retirement “if he considered it expedient”. On the basis of that notice, Rajapakse extended the appointment of the attorney-general, who was due to retire at the end of August, by six months. If the Constitutional Council had been established, it would oversee any extensions of service. The Centre for Policy Alternatives contested the gazette notice as a violation of equality and equal protection guaranteed by law. On September 22, the Supreme Court stayed its implementation. On October 8, the attorney-general announced his retirement, two days before the court was due to deliberate on the issue. In a third case, the Supreme Court issued a ruling on October 8 on a deal done by former President Chandrika Kumaratunga to sell a large plot of prime government-owned land to a private company to set up a golf course. The judges found that she had “completely betrayed” the public trust and “grossly abused the country” and ordered her to pay back 30 million rupees and return the property to the urban development authority. The various court cases are part of the subterranean political warfare within the country’s ruling elite as it confronts a deepening political and economic crisis compounded by the island’s reactionary communal war. Rajapakse’s threat against the Supreme Court judges demonstrates just how extreme these tensions have become. Presidential Adviser and former MP, Attorney at Law Vasudewa Nanayakkara has written to the President, himself a lawyer that the official website of the Defence Ministry has published an intimidating report on lawyers who appear for persons suspected of terrorist activities. “The Report has singled out the Tamil Lawyers who filed cases. Exposing the Tamil Lawyers in this manner is extremely dangerous and discriminatory.” writes Mr. Nanayakkara, who stresses that “Your Excellency’s speedy intervention into an extremely urgent matter.” is necessary. I write this as citizens of Sri Lanka, an Attorney-at-Law and colleague of Your Excellency and expect Your Excellency’s speedy intervention into an extremely urgent matter. The defense Ministry Website: www.defense.lk carried a Report titled “Who are the Human Rights Violators”. This report was uploaded on 16-11-2008 but still on the web with one amendment. The original Report that appeared in the website is annexed for Your Excellency’s easy perusal. This Report deals with 9 cases, which were filed in the Supreme Court under the Fundamental Rights Jurisdiction. The intention of this Report is clearly to create an opinion that those who file Fundamental Rights cases for LTTE Suspects are unpatriotic and working against the interests of the country. This Report has the effect of inciting people to condemn the Lawyers and even possibly to attack them. Some of the cases are still pending and my information suggests that most of those cases referred to in the Report was withdrawn after the Attorney General agreeing with the Petitioners to discharge the suspects in the absence of any evidence. mentioned in the Report. It has also carefully avoided mentioning the Sinhala Lawyers who filed the cases. The Report has singled out the Tamil Lawyers who filed cases. Exposing the Tamil Lawyers in this manner is extremely dangerous and discriminatory. powerful unit operating within establishments to discourage Lawyers in appearing in cases for LTTE suspects. Your Excellency will recall that about a month ago a group claiming to be “Mahason Balakaya” circulated a ‘Threatening Notice’ intimidating Lawyers. A copy of this Notice is also annexed for Your Excellency’s easy perusal. In late October, Senior Human Rights Lawyer, Mr. J. C. Weliamuna’s house was attacked but there is nothing to suggest that there was a fair Police Investigation into the attack despite a strong request from the Bar Association. action to remove the Defence Ministry Website Report naming as traitors for appearing for clients which is a fundamental rights guaranteed under the Constitution. I hope Your Excellency will forthwith instruct those who are responsible for running the Website to desist from intimidating, threatening and inciting against the lawyers for carrying out their professional duties. Finally, let me request Your Excellency to protect those Lawyers whose names have appeared in the website from any form of coercion or physical harassment. I have no doubt that as a person who stood for Human Rights in late 80’s Your Excellency is sensitive to this issue and intervene forthwith. CC: 1. Mr. Gotabhaya Rajapakse:- Secretary, Ministry of Defense. 2. Mr. W. D. Dayaratne:- President, Bar Association of Sri Lanka.